This just in from The Bean! If you are wondering exactly who The Bean is we will let you in on a little secret --she is also known as Kathleen, Wif, Aunt Kathy, Nana, Mom, Mommy and Kathy, her full name is Kathleen Madge Maureen Horan Daniels. Next week we will formally introduce you to her. AND we are happy to announce that she will be offering next week's Challenge! Just like Corduroy, the huggable bear, waiting to be loved, my books stand in "readiness" waiting to be soaked in. I, like many of you, read several books at once depending on my mood and interest at the moment. My books also display my pre-retirement trade as a career counselor along with my artistic and gardening avocations. I was reflecting that 6 of these books were given or recommended to me by family or good friends who know me well. Another Country by Mary Pipher, PhD – almost finished; loved it as the post-its will tell. It’s the one in front minus the cover which I hope I can find. 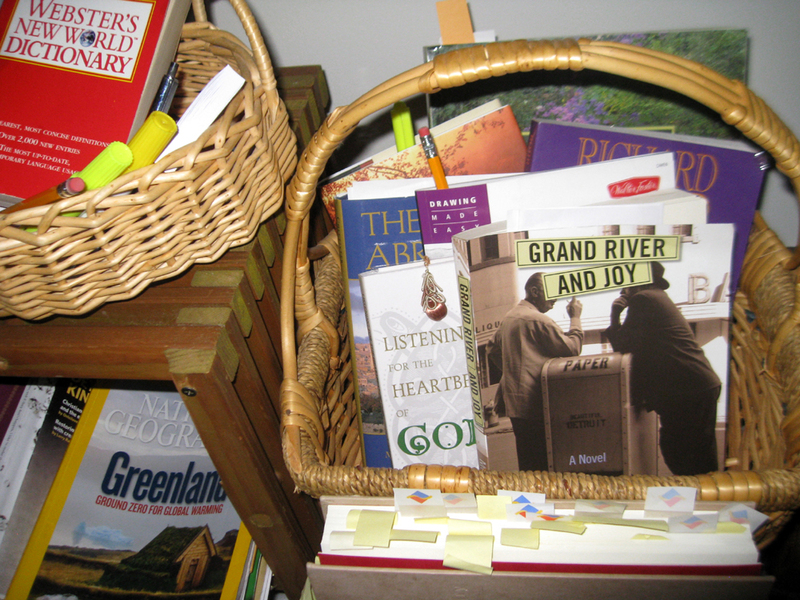 Grand River and Joy by Susan Messer – about Detroit where I lived for 40 years. Sometimes, I just grab a magazine like the National Geographic, Sojourners, or RealSimple. Most stories (from compelling to curious, from educational to frivolous), pictures, and recipes are amazing. Last but not least is my basket with the dictionary for new found words; along with post-its, pencils, and highlighters (if the book is mine, I definitely highlight and write in it!)" Just wanted to say thanks to The Bean for having my book on her bedside table and featured front and center in her basket. This website is a wonderful celebration of a family of readers. A friend lent us your book. My husband read it first. The scene of the Detroit store owner and tenant revealing what it means to be Jewish and Black over a “softening” bottle in the store basement was heart-rending. I look forward to reading your book.